Well, here we are again. Another year has come and gone so fast I barely had time to get used to it being 2008 and now there’s a whole new number to contend with. If you ask me time is moving entirely too fast these days – weeks, months, years are flying by so quickly I don’t even have time to remember how old I am let alone what date to write on my checks. And does it disturb you as much as it does me that we are one year away from the end of the decade, yet we still have no consensus on what to call it? I mean, Manuel and I crack ourselves up by calling it the ‘uh-ohs’, and in Britain people chuckle over the vaguely-naughty ‘noughties’, but I honestly have no idea what respectable newscasters in ten or twenty years’ time will be saying. “Back in the double-zeros…”? “Shortly after the turn of the millennium…”? “In the early two-thousands…”? Do they all sound as ludicrous to you as they do to me? And then, of course, there’s the whole January-means-resolutions thing to contend with. Normally I’m quite happy to start the year with a bit of a self-improvement regimen, resolving to do things like eat less and exercise more (particularly since however hard I try to show restraint during the holidays I always end up inhaling everything in sight), but this year things are different. I still need all the self-improvement I can get, for sure, but what with all the doom and gloom and economic misery lurking around every corner, I’m not sure my psyche can handle it. And from the look of things on the pages of the nation’s food magazines, who are all playing up comfort foods at the expense of the traditional get-healthy fare this month, it seems I’m not alone. Rather than forego resolutions entirely this year, though, I’ve decided to approach them in a different way. Instead of setting vague, lofty, and let’s face it, unattainable self-improvement goals like I usually do – drop a dress size or six, uncover my inner marathon runner, etc. – I’ve come up with a list of things that are specific, do-able, and don’t involve any self-torture, yet if upheld will still greatly improve my quality of life. Things like: 1) keep my knives sharp, which, now that I actually have sharp knives* for the first time in, oh, half a decade, makes chopping onions the highlight of every evening, and 2) finally learn how to parallel park, which, I swear to you, I haven’t even done once since I somehow passed that portion of my driver’s test fifteen years ago. And then there’s my favorite, 3) eat more vegetables, which I added to the list in the middle of Christmas dinner, about three seconds after I put a bite of the following recipe in my mouth, and about thirty seconds before various members of my family, in a show of very un-Christmas-like behavior, began fighting over the remaining pieces of it (leaving, I might add, the whole cracked Dungeness crab and cheese-flecked corn pudding practically forgotten). So there you go. Sharpen knives, learn to park, and eat my vegetables. If I can manage these, 2009 should be quite the year. *Hooray for free knife sharpening at Central Market! I found this incredible squash dish when I was trolling the web for something to complement our Christmas crab and corn pudding meal, and I’m not exaggerating when I say it stole the show. There were fewer leftovers of this than of anything else we ate that night, including the triple-chocolate-raspberry-marsala trifle, and the next day, when I handed my 21-year-old brother his bag of leftovers before his drive home to Olympia, the only thing he verified was whether I had given him any squash. I hadn’t, actually, since I was hoping to eat it all myself! Preheat the oven to 400F/200C. Line two baking sheets with parchment paper. Halve each squash lengthwise, then cut off and discard stem ends. Scrape out the seeds and cut the squash lengthwise into 3/4-inch-wide wedges. Toss the squash with black pepper, 3/4 teaspoon salt, and 2 tablespoons (30ml) oil in a bowl, then arrange, cut sides down, on the baking sheets. Roast the squash, switching the position of pans halfway through roasting, until squash is tender and undersides of wedges are golden brown, 30-40 minutes. While the squash roasts, mash the garlic finely with remaining 1/4 teaspoon salt in a mortar. Transfer the paste to a small bowl and whisk in lime juice, honey, chile (to taste), cilantro, and remaining oil until combined. Taste for seasoning and add more salt or lime juice as needed. Transfer squash, browned sides up, to a platter and drizzle with vinaigrette. I always love to roast acorns, but never thought about a chille-lime pairing. I finally got a good knife (a Victorinox) as well, and I am loving it! QFC also offers free knife sharpening. Oh yes, this does sound quite fabulous. I really love roasted winter squash of almost any type! these resolutions sound great and this squash looks delicious! you’re so right – about the sharp knives and the vegetables, i mean. i have recently been given a stone for sharpening the knives, but have no clue how to use it. am waiting for my dad to come next week to give me a tutorial, a friend of mine sharpend her on the base of her mug, don’t ask me how that works, i am reluctant to let her show me with my global knives ;-)and as for the veg, it’s amazing how we get stuck with the same old ways of making them day in, day out – when they’re so versatile! i will definitely try your recipe tonight, have some acorn squash left over from yesterday… it sounds delicious! I sorely miss acorn squash here in the Netherlands. I’m going to have to try and grow my own next year. This dish looks divine! I adore this – the confetti of chilies and cilantro adorning the squash just looks lovely, and surely tastes even better. Love the idea of goals within reach; I too am one who attempts to be overly lofty sometimes. What I have done this year is to buy a notebook, and I have been jotting down whatever notions catch my attention – everything from "read this book" to "declutter the den". It is sort of a running to-do list, and affords me some gentle reminders that cover all aspects of my life. I do believe I’ll be adding "roast acorn squash" to it soon! Cheers. I had some squash and limes so I made this for lunch today. It was delicious (I had to use maple syrup instead of honey).Great resolutions…there is nothing worse than a dull knife, and with more veggies you’ll probably achieve some of the other things you mentioned above without having to declare them as resolutions.I have to admit I’m a pretty good parallel parker…it’s all in that first initial angle when you back into the spot. Comes naturally with some practice and being forced to do it. I was driving stick and living in San Francisco for five years…if I didn’t get it right the first time I risked ruining multiple bumpers or slipping downhill. I stuck to one simple resolution this year, one I was certain to manage- to eat more! So I’ll have to make this (all in the name of keeping up resolutions of course!). It looks delicious. If you haven’t tried it before I’d whole heartedly recomend the roasted cauliflower recipe on orangette (http://orangette.blogspot.com/2006/10/smaller-sweeter.html). It’s definitely a "Wow, is this really good for me?" kind of recipe. Yummy! I adore this – the chilies and cilantro adorning the squash just looks lovely, and surely tastes even better. stuck to one simple resolution this year, one I was certain to manage- to eat more! So I’ll have to make this (all in the name of keeping up resolutions of course!). It looks delicious and i certainly must complete it again and perfect it! congrats!!! I have been making something similar using roasted cubes of sweet potatoes, which surprised my friends at a holiday pot-luck. These flavors go well on eggplant as well, when we come back around to eggplant season! So there are two more vegetables! Horray for New Years.My resolution (well, one of them) is to bake all our bread myself. I’ve had a very good start so far……. i love acorn squash and never thought of pairing it with a chili lime Vinaigrette or having it with with christmas crab and corn pudding for that matter. Thank you for the inspiration. it’s so pretty too. Looks great! I’ll try it soon.Why not learn to sharpen your knives yourself? Buy a couple of water stones and go for it. It’s not at all difficult and makes a huge difference–you can keep your knives razor sharp all the time, without them ever leaving your kitchen. Plus it’s kind of fun! I’m with Adam about sharpening your knives at home. Can’t go wrong with a diamond steel to keep your knives sharp. I’m also nervous about letting others sharpen my knives…they are one my most prized possessions! That looks really good, i am having people over for dinner tonight and am calling my husband right now to get some acorn squash! Well, I’ve just posted an acorn squash recipe, but this one puts mine to shame I think.beautiful, rich colours and flavours! I use an EdgePro for sharpening my knives.. it seems to work pretty well – I am kinda too lazy to take them somewhere, and too frugal too (but free sharpening sounds good!). I have taken to eating quite a lot of glazed root vegetables through the week recently, and more squash at weekends. 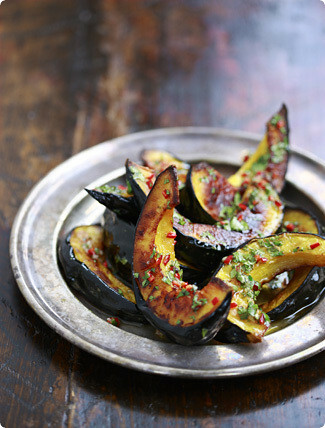 You are right, they are under appreciated.Great looking squash recipe, lovely photo as usual! I just had to make this dish the moment I read about it, and fortunately we had just deseeded 5 different types of pumpkin and were eager to do a taste test. In a word this was stupendous! We ate it for dinner, breakfast and lunch and really could go another batch right now. I’m also handing out your blog details to visitors to our farm stall so they can try the recipe themselves. I think we must be blogging kindred spirits as we have nearly the same header! I like yours better thaough!Lovely blog… my tummy is grumbling just reading it! Loving this Asian variant on roasted squash. I’ll try this out immediately. Love your blog, by the by. Yum. This looks so perfect, I could eat it for a whole meal. Thanks for the recipe! I’m thinking this would be perfect with Delicata or Sugar Loaf squashs since their skins soften and are edible when cooked. Always good to see squash done "new". I made this to accompany a main course last night and since i had planned to serve it at room temp, it was sitting on the counter while I finished cooking the rest of the meal. It was so good that my boyfriend ate the entire platter (albeit half the recipe as posted) before I had finished cooking the rest of supper. (Ok, I confess that I helped him, in the name of "tasting". )I’m thinking the vinaigrette would also be delicious on roasted carrots.I have yet to try a recipe you’ve posted that we haven’t liked. When I told the fella that the recipe came from the same site I got the Georgian cheese bread idea from, he strongly suggested that I made that again….very soon. Thanks for reminding me about the wonderful recipe. That photograph is incredible, as are all the others on this site! I loved this, and have absolutely enjoyed eating the leftovers (there were only 2 of us eating) for the past few days. Just as good cold, I might add. I make something like this except that I puree the squash like mashed potatoes and then mix the equivalent of the vinaigrette in with the puree. It taste so light and fantastic. Sometimes I also sprinkle parmesan and stick it under the broiler for a couple of minutes also. One of my favorite veggie dishes. HelloGreat Blog I will definitely bookmark your blog. I am also having a blog related to food and drinks http://foodmarketnews.blogspot.com/ which gives latest analysis and trends in food and drinks industry in the present recession period. I would appreciate if you could kindly bookmark my blog too. Just found your recipe while looking up my usual vegetarian sausage acorn squash recipe. Thought I would take a peek and the gorgeous picture won me over. I immediately went to green life and picked up the things I needed. Raves all around! I just think there needs to be more vinagarette–perhaps I’ll toss it in it for better coverage and sprinkle the cliantro. Just wanted to say, I get a LOT of my recipes online, since I an a converted vegetarian and my gut tells me to follow your suggestions. :)Do you have a place to subscribe to? Yum, this recipe looks delicious! I am a big fan of acorn squash, lime, and cilantro but have never paired them up… will have to give this a try. Thanks for sharing! Such an amazing recipe. Thanks. This will become a family favorite. So easy to make and the lime chili vinagrette is outstanding.